- Operating Temperature : -20?~ 40? 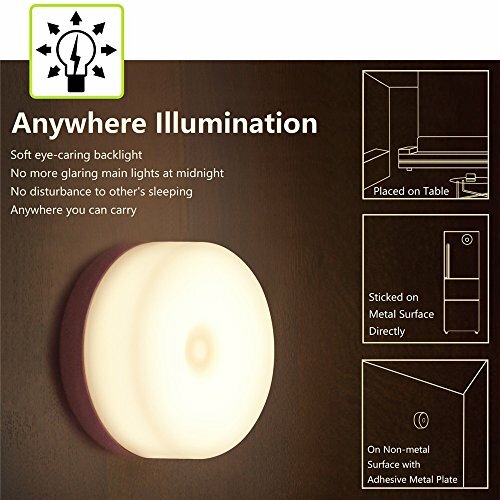 - Product Size: 2.56" x 1.65" x 2.56"
- Running time per charge varies with the brightness chosen. 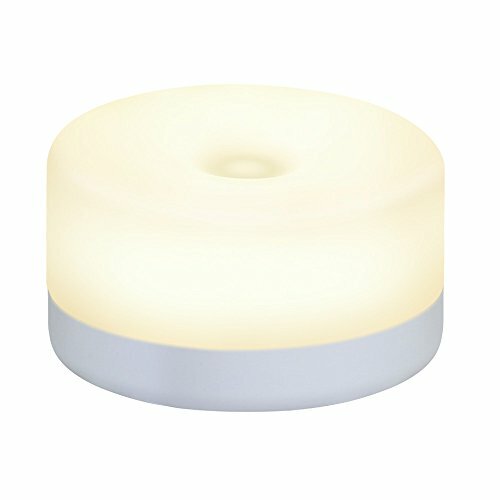 Normally if in highest brightness level, 2.5 to 3 hours continuous lighting is applicable after fully charged. And if in low light level, then the light will last for around 24 hours. - Charging time around 1 to 1.5 hours with standard mobile charger. - Red light indicating while charging, red light off after fully charged. 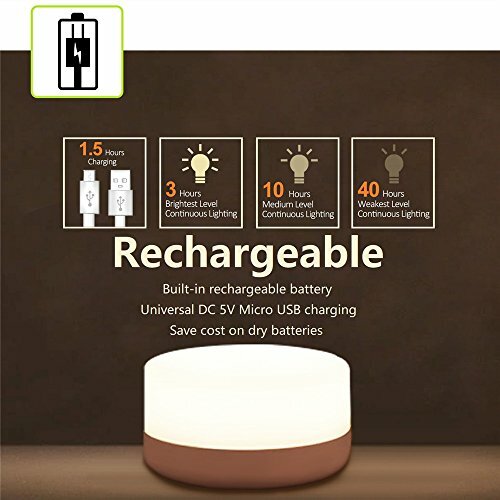 This rechargeable LED touch light is mini & handy, perfect to be as bedside lamp for kids and adults, atmosphere decorative mood light, lovely children nightlights, kawaii desk lamp, baby nursery night light. Suitable for bedroom, baby room, dinning table, etc. A fabulous gift idea for your beloved ones. - The Mark "TOUCH SWITCH · DIMMER" on the lamp is a removable label stuck. ?-?RECHARGEABLE & MAGNETIC ADHESION?---Built-in 500mAh Battery Powered, never worry about replacing dry batteries. With stainless steel magnet on the bottom, you could adhere this mini touch light to any metallic surface directly or to Non-metal places with 3M metal plate. 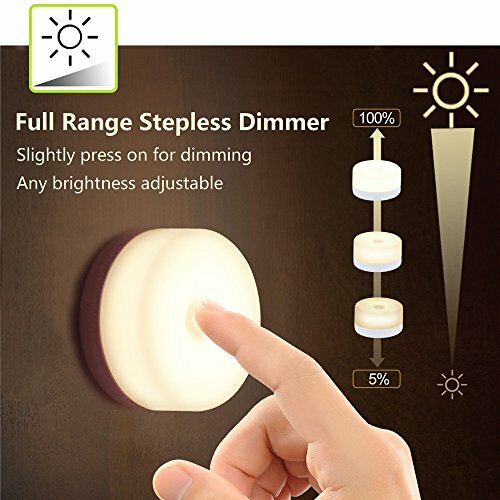 ?-?TOUCH SENSOR SWITCH & STEPLESS DIMMER?---With Touch Sensor Switch to power ON/OFF by one touch and Stepless Dimmer brightness adjustments by holding down for seconds. ?-?BRIGHTNESS SETTING MEMORY | SAFE & EYE-CARING?---When you set the Brightness and turn off the light, and next time when you turn on the light, the brightness is shown as you set last time. And it is safe for touch of children compared to other night lights connected directly to the socket. Bezelless Design with Eye-caring Translucent Sheet Cover, no more dazzling bright light and be eye-caring. 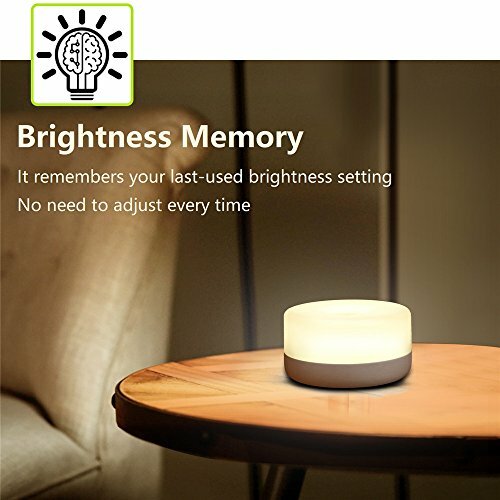 ?-?SCENARIOS?---This rechargeable LED touch light is mini & handy, perfect to be as bedside lamp for kids and adults, atmosphere decorative mood light, lovely children nightlights, kawaii desk lamp, baby nursery night light. Suitable for bedroom, baby room, dinning table, etc. A fabulous gift idea for your beloved ones. 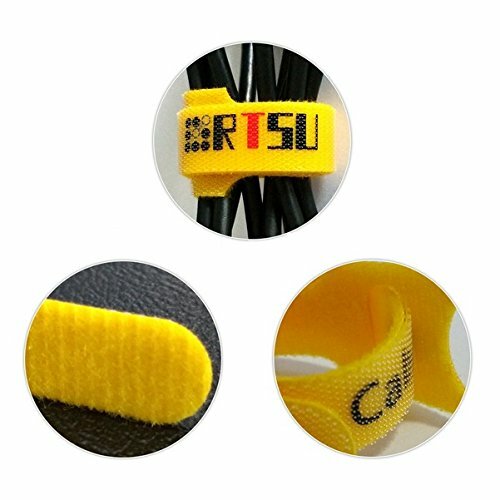 ?-?WARRANTY?---100% RTSU® Guaranteed Product Satisfaction, 30 Days No Hassle Money Back and 1 Year Warranty.